Back in college, I got tired of only knowing how to cook spaghetti, at least only knowing how to cook spaghetti well, so I started watching cooking shows and experimenting in my kitchen. I would use my friends as guinea pigs. Before long, they started looking forward to my calls to come over for my latest creation. One weekend my parents came to visit and I wanted to cook something special I had been working on. There wasn't time for a trial run with the friends, so Saturday night was purely experimental. Fortunately, after a day of visiting west Texas wineries, the experiment paid off. In my kitchen that night, I cooked Pork Chops with Caramel Apples for the first time. 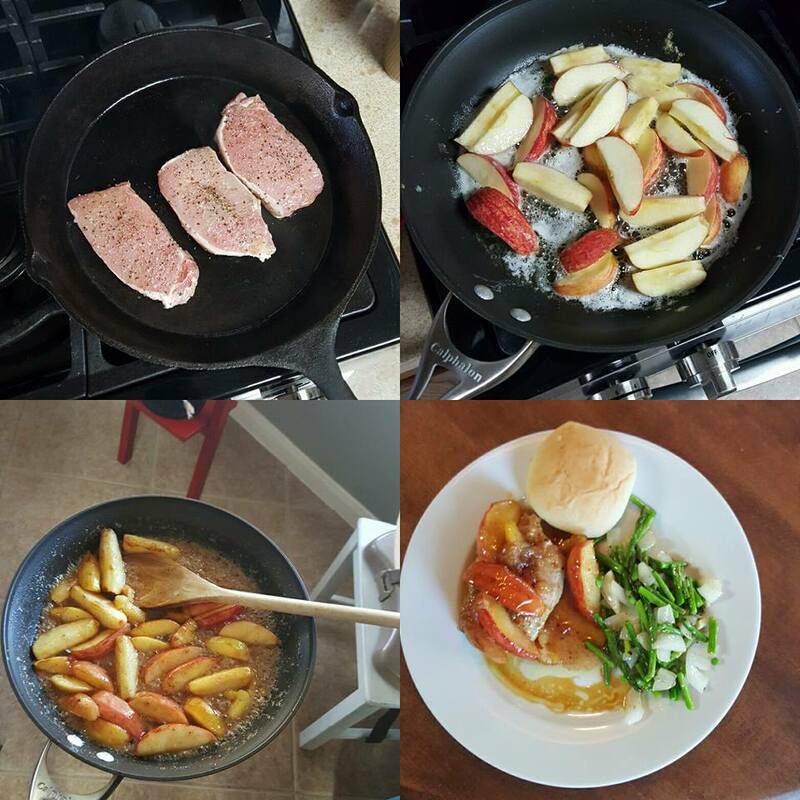 Top Left: Seasoned pork chops in cast iron skillet. Top Right:Sliced apples sauted in butter. Bottom Left: Apples in finished caramel sauce. Bottom Right: Pork chop with apples and caramel sauce. Served with sauted asparagus and onions. Brush the pork chops with olive oil and season with salt and pepper. Place in cast iron skillet over medium-high heat. Cook until done, flipping as needed. Melt the butter in a skillet. Add the apples and cook until the apples change color. Add in a few shakes of cinnamon and nutmeg. Add the 1/2 cup of sugar and cook until dissolved. It is important not to cook much longer after the sugar is dissolved so that the sauce doesn't turn too thick. I have served this with mashed potatoes, pureed cauliflower, roasted potatoes, and in this case, sauted asparagus and onions.